The Riviera Nayarit Convention and Visitors Bureau is known for organizing and hosting dozens of tourism events throughout the year, but it also lends its considerable support to other non-profit organizations that have the firm intention of carrying out charitable work. There are several charity events taking place in November, which are detailed below for information purposes and to encourage participation. 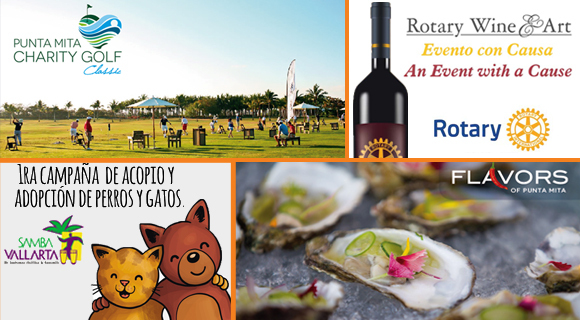 The Club Rotario Bahía de Banderas announced its Rotary Wine & Art event benefitting Casa de Bucerías Tercer Edad. The activity will take place at the Nuevo Vallarta Plaza Business Center on Saturday, November 12, 2016. There is a $200 peso donation requested and children can attend for free. There will be art, wine, appetizers, fine jewelry and live music. For more information call 322 209 18 20 or 322 190 38 34 or email rotarywineart@pacomex.com. The Punta de Mita Foundation is collaborating with the Punta Mita development, the Four Seasons Resort Punta Mita and The St. Regis Punta Mita Resort to host its yearly Sunday With A Cause fundraiser event in pro of the local community. The date is set for November 20, 2016. The Punta Mita Charity Golf Classic kicks things off at 9 a.m. on the Bahía Golf Course. Each player receives a goody bag from the sponsors; the game format is a scramble with women’s, men’s and mixed categories. Player donation is US$200. That afternoon at 6 p.m. it’s time for the Flavors of Punta Mita, which this year takes place in the Altamira Lobby at the St. Regis and has a US$70 donation fee. Gourmet food, artisanal beer and champagne will flow in a festive environment. Forty percent of the winnings are earmarked for the Punta de Mita Foundation, forty percent will go to Peace Punta de Mita and the remaining twenty percent will be destined for the next Conservation Fund. For more information call 01 (329) 291 5053 or email anabel@fundacionpuntademita.org. The Dogs For Life association and the Hotel Samba Vallarta, located at the Condominio Maestro Flamingos, will host their first annual Collection and Dog and Cat Adoption Campaign for all those who would like to adopt a new pet or donate food, medicine, clothing or toys for the animals. The activity runs from 10 a.m. through 2 p.m. on December 10, 2016. Adoptions will incur a minimum recovery fee.